My name is Danielle Williams and I am so excited for my third year at E.K. Baker! As the school counselor, I am here daily to assist students, teachers, and parents. I provide services to promote students' academic success, social skills, and career development. These services include classroom guidance lessons, small groups, and individual meetings with students. I want to make sure that every student at EKB has a positive and productive year, so please contact me by email at dwilliams@mcminnschools.com or by calling the school at (423) 745-2760 if you have concerns about your student! The mission of the school counseling program at E.K. 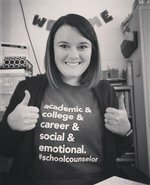 Baker is to provide all students with an excellent comprehensive school counseling program that helps all students reach their maximum potential as life-long learners and productive members of their community. This program delivers services through a tiered system of support including classroom guidance lessons, small groups, and individual planning services to support the academic achievement, career development, and social emotional growth of every student. The vision of the comprehensive school counseling program at E.K. Baker Elementary School is for every student to possess the academic, career, and social/emotional skills necessary to be successful. Our students realize their full potential and self-worth. They are leaders, problem solvers, and productive citizens. Our students are resilient when faced with challenges or adversity. E.K. Baker students make a positive impact on the lives of others and their community.